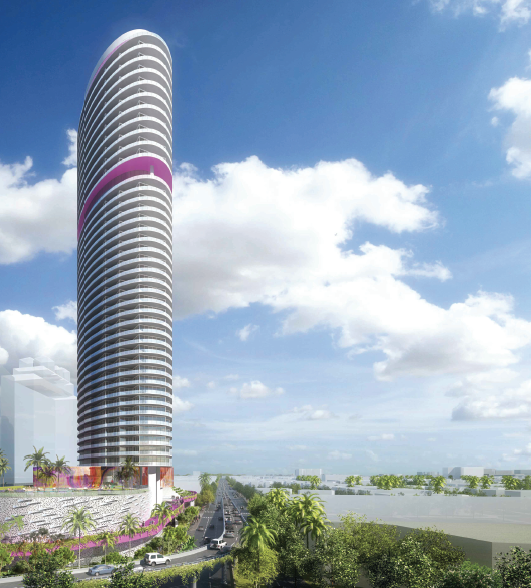 Developer Russell Galbut won approval yesterday from Miami Beach commissioners for a plan that will bring a new park and high-rise condo tower to Alton Road. As part of the deal, the developer will pay for and oversee construction of a 3 acre park. 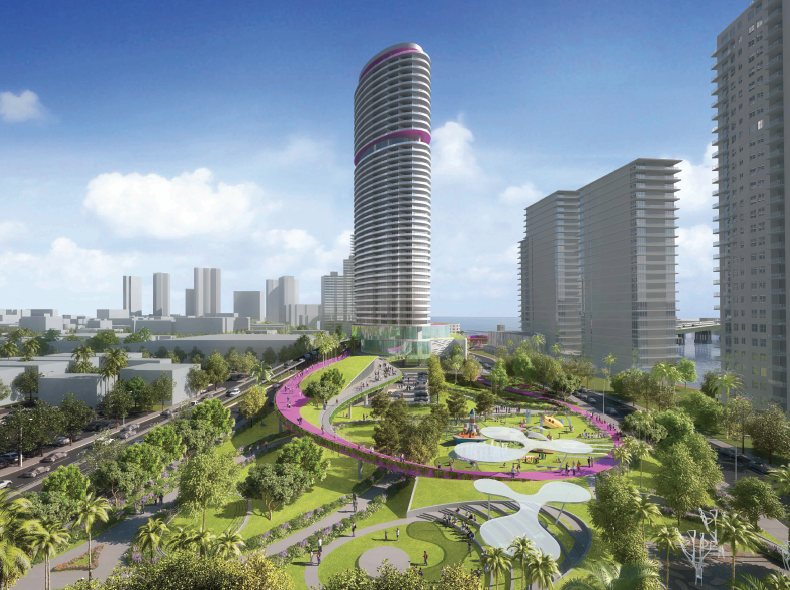 It will be connected to the baywalk that runs through South Pointe Park by a pedestrian bridge, which itself will be paid for by taxpayers through a bond issuance approved last week. The old South Shore hospital on the future park site must be demolished within six months after approval of the new project and appeal periods have expired. 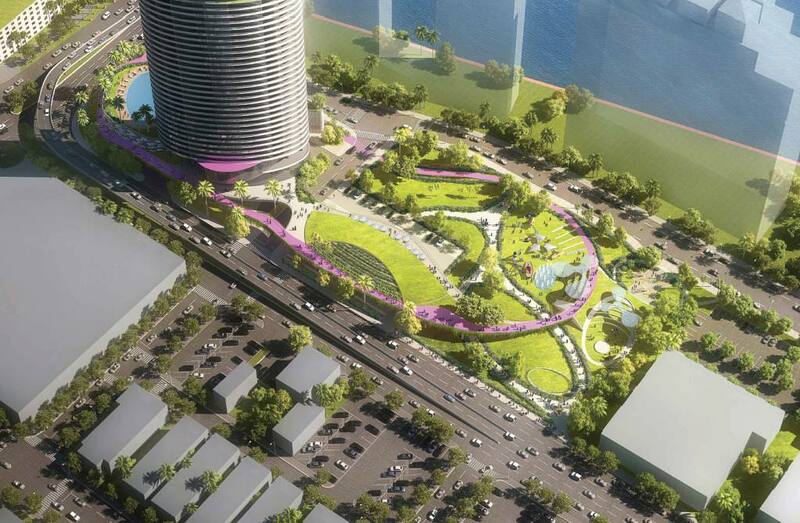 The park must then be completed eight years after a construction permit for the new tower is issued. Galbut will be able to flip the property to another developer after obtaining the upzoning, as long as he or his family retains 10% ownership. The tower height was approved yesterday by commissioners to increase to 519 feet, higher than the 484 feet previously approved by city boards. A second reading is scheduled in December. I am completely in favor of this project. We MUST think of sea level rise solutions being incorporated into each and every project! I applaud Ray and Arquitectonica for this great work. Showing the rest of the City and the world that Miami will be resilient and continue to come up with solutions to thrive. Well, build some kind of rail link from mainland Miami to Miami Beach and all the way up to Sunny Isles Beach so that the rest of the city and county can start showing some kind of connectivity. but are stuck in the same traffic as every other vehicle. Not sure how an additional road lane on two major roads is a solution for sea level rise. Maybe we should be looking at different transportation solutions? How do you get anything about transportation from my comment about adding a large green space that can help with stormwater? Bravo Mr Galbut! Some how you took people’s fear of traffic and managed to turn a lot with a 75′ height to a 500′, all while keeping the intensity (similar number of units) the same, and not precluding the possibility of a rental tower. And there is still 8+ years for the park to be delivered? very glad this was approved, but the Pedestrian Bridge that will serve as an entrance to South Beach looks to be as basic as possible. I’m hoping it’s a placeholder for an iconic, improved design. 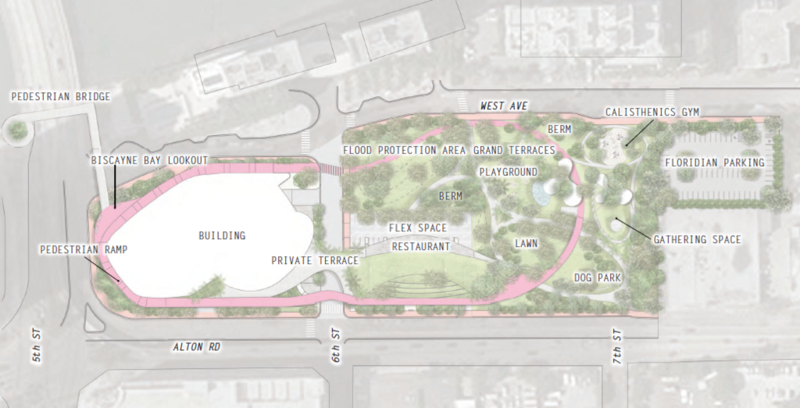 & who approved the 8-year timeline for the 3-acre park? I assume the south end of it will be used to construction staging, but why not build it out in phases, starting from the North? I am a big proponent of extending the Metromover from the Art and Space Museum at the Omni to this Park in South Beach. It would be amazing. Here is me crossing my fingers that this will actually happen. Yep double car it like the inner loop or triple car it due to the high demands and run it from the Museum to south beach. 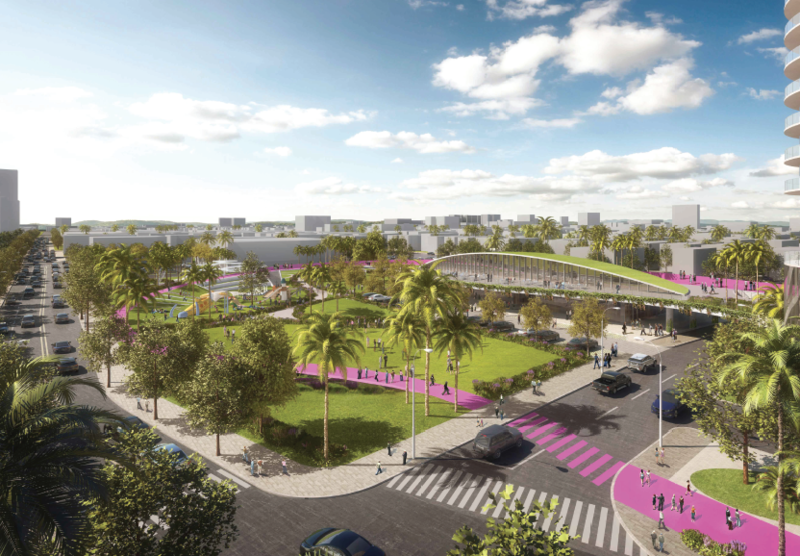 Then extend the metromover from school board station up north miami ave so connecting it to wynwood and midtown. Running it over the other causeway and connecting that to the line on south beach. I live in front of a Metromover station and use it a few times a week. I would love to go to South Beach on it. I wish there was a petition we could sign. I know there have to be thousands of people who feel the same way. A triple car Metromover wouldn’t satisfy the ridership Baylink would have. It has to be MetroRAIL, new light rail, or see Metromover upgraded into a proper train. Nice park, which Miami Beach must be sorely in need of I guess, but contrary to the video’s lead-in neither “intensity” or “density” has been changed. It’s just been stacked vertically into a 42 story tower. Cheers. Flamingo Park is literally a few blocks away. Tear down the flyover, and make the intersection of 5th and Alton more pedestrian friendly. Nice to have open space high building seems like a good solution… that lot would also be ideal for train station from Downtown Miami. The park will be in the shade all winter and most of fall and spring. Keeping it much more bearable. Which is highly preferred. If West Ave residents wanted to bask in the sun, they can do so in their own pools. I’m sorry, but this stretch of Alton Road doesn’t need a park, it needs residents to liven it up! A dense, low-rise rental tower would have done that. Most South Beach parks are well maintained. Hey, you humans have the beach, we have the parks. Oh wow, a park.. can’t wait to go there so I gawk at the babes in string bikinis… oh wait…..
Why? Continuum and Portofino Tower are about 500 feet. It’s within the scale of the neighborhood. It’s all beautiful, Height/ Architecture/ Park/ Bridge. I’m all in.